What Is a Statement Necklace and Why Do I Need One? A Statement Necklace is a necklace that makes a huge statement when you put it on. Often these pieces are quite elaborate and flashy. I love a good statement necklace. It can instantly add sparkle and intrigue to a relatively tame outfit. It can be a conversation starter as well. In short, there’s nothing better than a unique statement necklace. Did you know you can make your own? 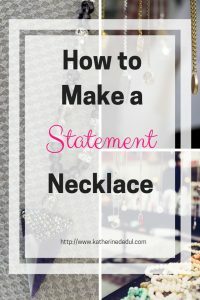 This week, I’m going to show you exactly how you do it, by creating a statement necklace for myself. Let’s dive right in, shall we? You don’t require a whole lot to get going, but you’ll need some pliers. 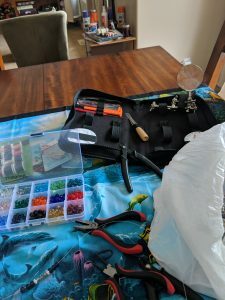 I have a fantastic kit that I bought a few months ago on Amazon and it has pretty much anything you’ll need for under $50 (This Jewelry Making Tool Kit Has It All, Jewelry Pliers, Helping Hand Magnifier Stand, Needle Nose Pliers, Wire Wrapping Tools, Bead Crimper Pliers, Beading Needles, Beading Line, Thread Snip, Caliper, Awl, Tweezers, a Threader It Is Ready For Gifting ). It even comes in a handy zippered carrying case for extra portability! Signature Tools has a lot of different packages available as well, and I am happy with their products, so I highly recommend you check them out. If the kit I have is too expensive, I’m sure you can find something that fits your budget better. So as you can see, I have all my equipment and beads and findings assembled. So I’m ready to get started, how about you? For necklaces, you have to choose a length. I like longer necklaces myself, they tend to fit better with most of my wardrobe. 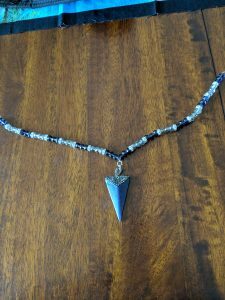 The first rule of jewelry making is that if you want a necklace that is 60 inches long, you can make a necklace that’s 60 inches long! It is your choice! My necklace is what I call a half-beaded necklace. The front bit is beaded, but the remaining part is a chain that secures in the back. 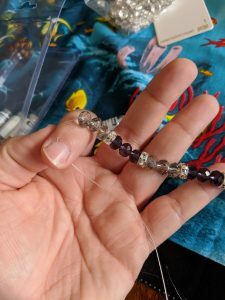 I sadly did not have the chain for the back at the time of this post (I seriously need to organize my beading supplies better, but that’s another story for another day). 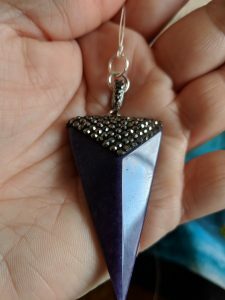 I always attach the pendant in the middle of the wire. I used two jump rings, using a crimp tube to secure the assembly to the wire. The pendant is twisting a bit more than I’d like, but for now, I’ll leave it and see how it hangs once it’s completed. Sometimes once you’re all finished with a project, you find things work out just fine on their own. It’s a heavy enough pendant that it might be fine once I have the chain on it and am wearing it, otherwise, I may take out one of the jump rings and see how that works. Next step, I began stringing my beads on the wire. I used a 3-spacer-3 pattern. So three purple beads, a diamond spacer, and 3 smoky beads basically until I had five “clusters” of purple beads on each side of the necklace. Finishing off the necklace, I made a loop and crimped it off at each end. When the jewelry chain I ordered through Amazon arrives, I’ll attach the chain to those loops. I use my round nose pliers to essentially size out the “loop” in the wire and then a crimp tube to secure it. And that’s it! Necklace made! It took me about twenty minutes from start to finish, maybe a little longer as I experimented with beading sequences. I hope you enjoyed this fun tutorial, if you did, please share it with your friends using one of the social share buttons. Also if you have any questions or comments for me, I’d love to hear from you, drop a comment down below.